GLOCON INTRODUCES SWIFTER® ULTRA-LOW-SOUND SERIES AXIAL INDUSTRIAL FANS. The Swifter® Ultra-Low-Sound (ULS) Series industrial fans provide solutions for sound sensitive environments. ULS Series fans are available in 7 standard diameters ranging from 63” to 156” and are amongst the industry’s lowest sound generating fans. The extra-wide chord width curved blades allow for smooth airflow with minimum air separation and turbulence. Constructed of high-strength light weight FRP with UV-resistant surface coating and leading-edge protection, ULS series single piece molded fans offer performance, reliability and durability unsurpassed in the industry. ULS Series fans are ideal for use as OEM or replacement parts in equipment such as evaporators, cooling towers, condensers, exhaust & ventilation systems. ULS Series fans are widely used in data centers, industrial refrigeration plants, food processing, power generation plants, commercial/industrial HVAC. For a straight 3rd year in a row, Glocon Inc. exhibited at the Annual Cooling Tower Institute (CTI) Conference. This year the conference was held at the Hilton Hotel in Houston, Texas from Feb. 5 – 9, 2012. Amid technical workshops and committee meetings on various topics related to cooling tower technologies, Glocon was pleased to be able to host a table at the conference as a supplier of cooling tower fans and subcomponents. “It’s always exciting to be here for the annual conference. No place else can you find such a focused audience interested in learning about our niche product,” says Arjun Agarwal, VP of Glocon Inc. That niche product is the Swifter® line of industrial fiberglass fans, or CTX Series. Ranging from 5 feet to 40 feet in diameter, it is still the next generation industrial fan with its innovative features such as patented airfoils for optimized airflow and CoreMaxTM polyurethane foam core for superior blade performance. Glocon manufactures the Swifter® CTX Series industrial fans for a variety of applications, including cooling towers, air-cooled heat exchangers, evaporators and condensers. Glocon is also the manufacturer of Swifter SW/SE Series axial impellers which can be used in industrial ventilation applications. The company’s newest innovation is the Swifter® HVLS Industrial Ceiling Fan, which can be used in warehouses, commercial buildings, aircraft hangars, sports facilities or any large space with high ceilings. All of the Swifter® brand industrial fans use patented high efficiency fiberglass fan blades. For a straight 3rd year in a row, Glocon Inc. exhibited at the Annual Cooling Tower Institute (CTI) Conference. Glocon Inc. reports the performance findings at a municipal power plant installation in the state of Minnesota. A utilities company needed to replace the fans in a 3 cell cooling tower. Initially the company only replaced one fan using the original OEM compatible fan. One year later, they budgeted for the replacement of fans for the remaining 2 towers. 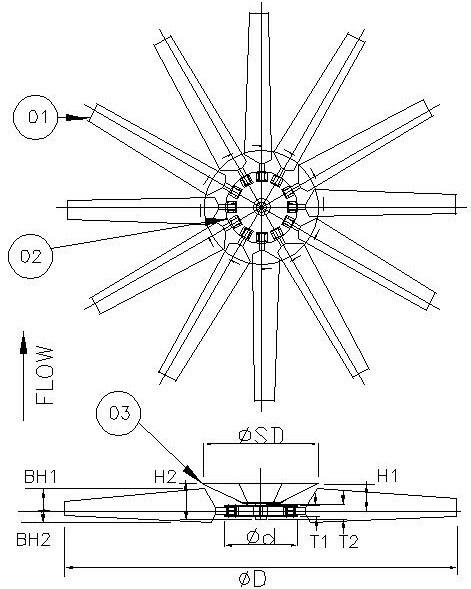 Glocon was awarded the project to supply two 22 foot fiberglass fans, based on advertised increased efficiency of the patented CTX Series fan blades developed U.S. Department of Energy’s National Renewable Energy Laboratory. After installation, Glocon offered to conduct an onsite performance test to prove the efficiency. Glocon is proud to share this customer testimonial. For more details about this project, or to learn about any of the industrial fans we offer, please call 973-463-7300. Glocon manufactures the Swifter® CTX Series industrial fans for a variety of applications, ranging from cooling towers, air-cooled heat exchangers to condensers. Glocon is also the manufacturer of Swifter® SW/SE Series axial impellers which can be used in industrial ventilation applications. 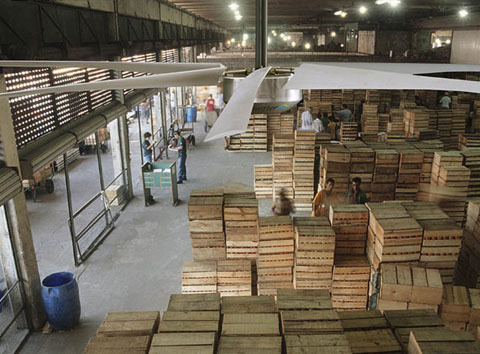 The company’s newest innovation is the Swifter® HVLS Hybrid Industrial Ceiling Fan, which can be used in warehouses, commercial buildings, aircraft hangars, sports facilities or any large space with high ceilings. All of the Swifter® brand industrial fans use patented high efficiency fiberglass/composite fan blades. Glocon Inc. reports the performance findings at a municipal power plant installation in the state of Minnesota. Glocon Inc. has completed over one thousand cooling tower fan installations worldwide. The CTX Cooling Tower Fan Series incorporates high efficiency patented airfoils and proprietary technology, in which the fan blades are molded into a single piece contiguous composite blade consisting of an outer fiberglass shell with an inner high density polyurethane foam core. The combination of the cutting-edge airfoil design and the unique molding technology results in industrial fans that provide improved efficiency, offer superior performance and exhibit high durability. Glocon Inc. offers custom design and manufacturing services to HVAC and process cooling industry. We can manufacture custom axial fiberglass (FRP) fan blades (airfoils), custom industrial blowers, fan stacks, fan shrouds, fan covers. In addition, Glocon can manufacture custom metal hubs in aluminum, stainless steel and other alloys. Glocon Inc. is a manufacturer of a premium line of industrial fiberglass fans, including Swifter® CTX Series Axial Fans for cooling towers and air cooled heat exchangers and Swifter® SW/SE Series Axial Impellers for exhaust, agriculture and other cooling applications. Glocon Inc. introduces its newest and most innovative solar-powered industrial ceiling fan. 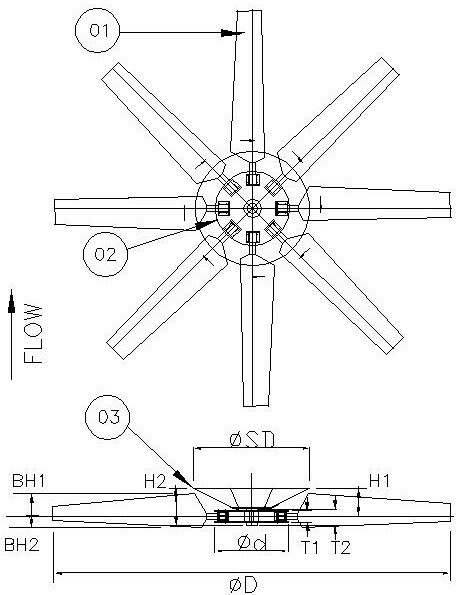 The Swifter® HVLS Series is a hybrid HVLS (high volume low speed) industrial ceiling fan. Available from 10 feet to 16 feet in diameter, it can be used to efficiently cool very large spaces, such as industrial warehouses, big box stores, manufacturing and assembly plants, large dairy sheds, gymnasiums and other commercial buildings such as theaters, sports arenas and airports. The Swifter® HVLS Series can circulate large volumes of air using less than 1 KW of power. In addition, because it is a hybrid system, the fan can operate with limited or no sunlight by automatically and seamlessly switching over to grid power. This eliminates the need for expensive back-up batteries. Glocon Inc. is a manufacturer of a premium line of industrial fiberglass fans, under the Swifter® trade name, including the CTX Series Industrial Fans for cooling towers and air cooled heat exchangers and the SW/SE Series Axial Impeller Fans for HVAC, exhaust, agriculture and other outdoor and corrosive applications. Glocon Inc. introduces its newest and most innovative solar-powered industrial ceiling fan. 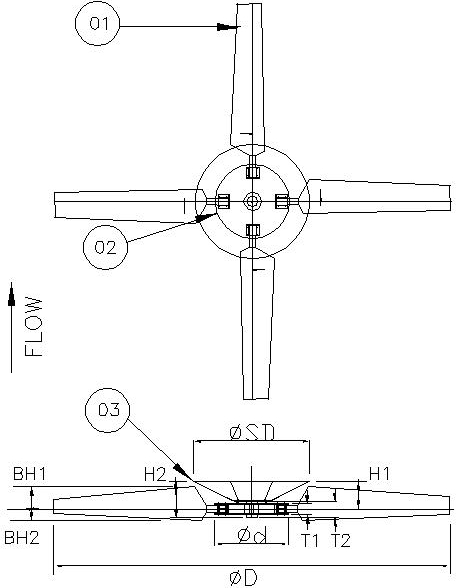 The Swifter® HVLS Series is a hybrid HVLS (high volume low speed) industrial ceiling fan. Glocon Inc. introduces its innovative CoreMaxTM technology, used in the next generation Swifter® CTX Series industrial axial fiberglass fans for cooling towers and heat exchangers. The CoreMaxTM proprietary manufacturing method involves a two part process in which a fiberglass blade shell is molded simultaneously with a high density polyurethane foam core and then infused together. This results in a contiguous hybrid composite fan blade that has superior reliability and durability over conventional hollow-core fiberglass blades. Glocon Inc. introduces the next generation of Swifter® CTX Series industrial axial fiberglass fans for cooling towers and heat exchangers. The CTX Fan Series incorporates high efficiency patented airfoils recently developed by the U.S Dept of Energy’s National Renewable Laboratory (NREL). Using Glocon’s proprietary CoreMaxTM technology, the fan blades are molded into a single piece contiguous composite blade consisting of an outer fiberglass shell with an inner high density polyurethane foam core. The combination of the cutting-edge airfoil design and the CoreMaxTM molding technology results in fans that provide improved efficiency, offer superior performance and exhibit high durability. CoreMaxTM lightweight fan blades are stronger than typical hollow core fiberglass fan blades. In addition, the completely enclosed blade virtually eliminates the possibility of moisture or condensation build-up on the inside of the blade; this minimizes fan unbalance during use. 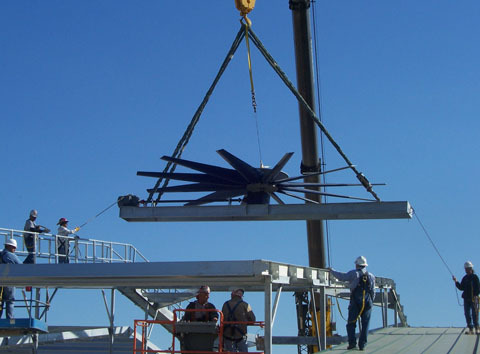 The CoreMax™ technology is used in CTX Series Fans 10 feet in diameter and larger. 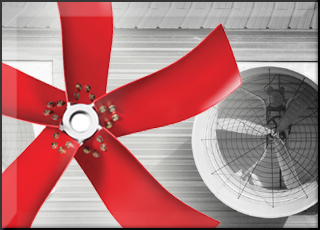 The CTX Series fan blades represent the most advanced airfoils and the latest fiberglass molding technology used to produce industrial fans that are truly new and innovative. Glocon Inc. introduces the next generation of Swifter® CTX Series industrial axial fiberglass fans for cooling towers and heat exchangers. The CTX Fan Series incorporates high efficiency patented airfoils recently developed by the U.S Dept of Energy’s National Renewable Laboratory (NREL). Glocon Inc. has introduced the Swifter® line of high performance industrial fiberglass props for use in a broad range of applications including HVAC, cooling towers, condensers, chillers, air cooled heat exchangers, ventilators and spray booths. The SW series props incorporate advanced composite technology and optimized aerodynamic blade profiles that provide greater corrosion resistance from exposure to chemicals and moisture, as well as higher total efficiency and less blade vibration for quieter operation. Due to fiberglass blade construction, the SW series props have superior structural integrity and can typically be operated at higher RPM limits to achieve increased airflow as compared to props having fabricated sheet metal or thermoplastic blades, yet the SW series props are lighter in weight than comparable aluminum cast props. The SW series props are available in standard diameters ranging from 20” to 60”. Swifter® props are made by using a unique breakthrough fiberglass molding process that reduces manufacturing costs significantly and produces props that are comparable in cost to aluminum cast props but provide more value. Using Swifter SW series props results in more versatile, robust, efficient and quieter fan and ventilator systems. Glocon Inc. manufacturers a broad range of engineered electro-mechanical and air movement components, as well as specialty heat transfer alloys and industrial castings. Glocon Inc. is pleased to announce the availability of its state-of-the-art Fan Selection Program for the Swifter® SW/SE Series Fiberglass Axial Fans. This web-based program provides a complete selection of our 20” – 60“ dia. high performance, corrosion resistant axial fans that includes performance data, curves, dimensional and material specs as well as noise ratings, all available through an extremely easy-to-use graphical user interface. The Swifter® SW/SE Series Fiberglass Fans are ideally suited for corrosive, humid, or outdoor applications, e.g. agriculture, condensers, evaporators, and cooling towers. Additional fan series available in larger sizes, up to 36 feet diameter. As Seen in Jan/Feb 2009 Issue of Process Cooling - Advanced Airfoils For The Changing Fan Market. As Seen in Jan/Feb 2010 Issue of Process Cooling - Saving Energy with Smart Air. Glocon Inc. exhibited its Swifter® CTX Series Industrial Fans at the Cooling Tower Institute (CTI) Conference held in Corpus Christi, TX on February 5th 2013. You can download the CTI Annual Conference News and see our Ad on page 2.